As many of you may already know, Natureworks is Monarch Butterfly headquarters in the area. 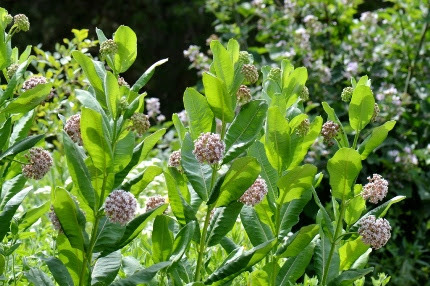 Our gardens are filled with milkweed and many other species and varieties of the genus Asclepias. Why? All butterflies must lay their eggs on what we call their larval food plants. These are the ONLY plants that the caterpillars can eat. For monarchs, its Asclepias. We finally have very young milkweed plants available for sale. Shown above is a stand of common milkweed (Asclepias syriaca) that Diane planted from a tiny seedling three years ago. Once it is established, it spreads really fast. It is not a good choice if you only have a small garden as it will take over the garden and other plants will be crowded out. It’s best in larger borders where you want it to spread. In my own yard, I let it grow in masses beneath flowering shrubs, mingled with goldenrod (for fall pollinators) and mountain mint (Pycnanthemum muticum) for summer pollinators. In one of my perennial beds where I inherited a big stand of invasive (but pretty) gooseneck loosestrife, I seeded in milkweed and the two battle it out quite well together. In my lower backyard, where I have recently done a lot of clearing, I spread milkweed seed with New England aster and Rudbeckia triloba seeds last year. All three are weaving together nicely from that small effort in late fall. (‘Hello Yellow’ is the name of the variety, I love that!). It grows 18-24″ tall and is in bloom now, continuing through July and early August. It has a tuberous root and wants full sun and a well drained soil. It is not a spreading plant. It forms a clump about 18-14″ across. 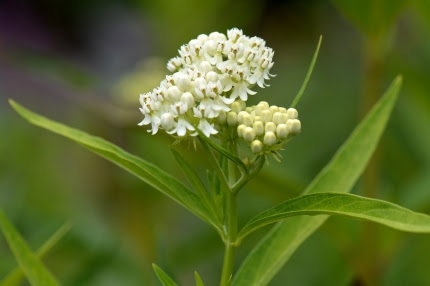 Asclepias incarnata is called swamp milkweed but it doesn’t have to grow in wet soil. 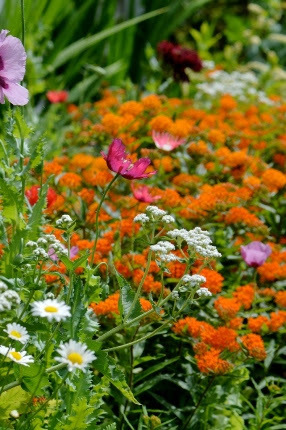 We have it growing in our Naturworks borders, in regular garden soil that is not regularly irrigated. This species grows 5′ tall and 18-24″ wide and has pink flowers. There is a white form called ‘Ice Ballet’. It will grow in full sun and also tolerate partial shade. Asclepias purpurescens is another form of perennial milkweed that has a darker pinkish/purple flower and is clump forming, ideal when you don’t want it to take over. It likes sun and grows 2-3′ tall. 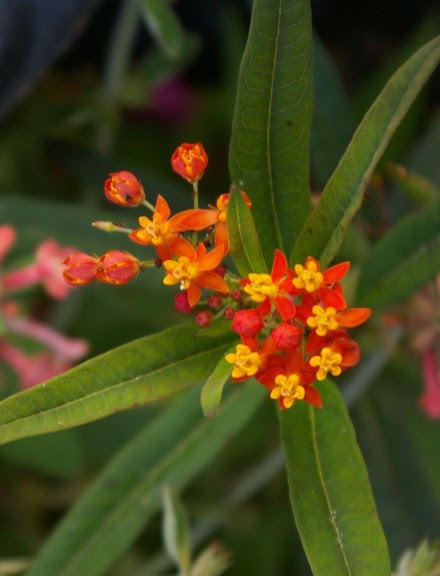 Annual Asclepias curassavica is great in containers or in the garden. variegated ‘Monarch’s Promise’ with white, cream, and green leaves and orange flowers. There are other species of Asclepias that we occasionally carry when we can find them. All are excellent larval food plants for our precious monarch butterflies. Because we raise the migrating generation in CT, it is critical that we offer them plenty of milkweed and all of its relatives when they arrive- which is NOW!